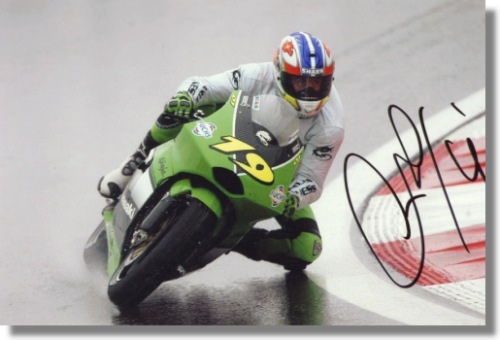 Olivier Jacque signed Kawasaki MotoGP Photo, Shanghai 2005. A great shot of Olivier enroute to Kawasaki's best-ever result in MotoGP sofar, second place in 2005 Shanghai Grand Prix. Olivier personally autographed this photo with a black marker. Dimensions: approximately 6 x 4 inches or 15 x 10 cm.